I had never been to Habanero Mexican Cafe until Jarod, The Commish and myself decided to try out some South First joints as our taco map was looking pretty east side heavy. As we fought our way through construction zone traffic hell to get there, I found myself wishing that we'd just gone somewhere on the east side again. Luckily, I forgot all about the traffic the moment we were seated and I had a chip full of the table salsa at Habanero. Red salsa is a funny thing in this town. It's absolutely ubiquitous, and has to be pretty damn bad or pretty damn good to be remarkable at all. The salsa at Habanero was really, really excellent. It's a thick pureed tomato salsa with a nice vinegar twang and a healthy amount of heat. I loved it, and the waitress was kept busy as our salsa cup constantly diminished. Now that I mention it, the service was actually quite good. Our waitress was friendly and we were never out of drinks or salsa. Nice. 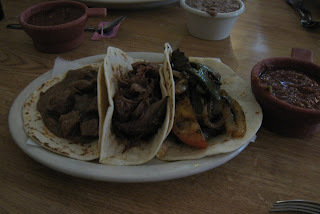 I ordered three nicely sized tacos for only $1.75 each: carne guisada, carnitas and fajitas rancheras. I'd like to start by saying the fajitas rancheras were absolutely freeking amazing. The tender, flavorful strips of flank steak were grilled up with tomatoes, onions and jalapenos, making for one fantastic taco filling. On my next visit, I'll probably go for the fajita ranchera plate and bask in the glory of a whole big pile of this stuff. The tortillas were par for the course, which is to say they'd be disappointing if it weren't for the fact that 99% of places in town use the same store bought torts. If I keep beating this dead horse, maybe we'll all start demanding better tortillas! Viva la Revolucion Harina! I also really enjoyed my carne guisada taco. In my experience, there are two main styles of carne guisada to be found in town. Some folks serve a dish featuring distinct blocks of beef cooked in a fairly thin gravy, while others cook the whole thing down further until it's hard to tell the beef from the gravy. I prefer the 2nd approach, especially as executed by Porfirios. Habanero goes with style one, but does it with style. The beef was very tender, and the gravy was flavorful. I would eat it again. The two disappointments were the beans and the carnitas. 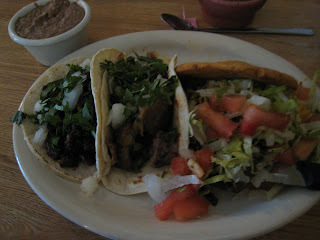 The carnitas were not very juicy or flavorful, and needed more than their share of the yummy salsa to make me happy. I won't be having any more carnitas at Habanero, but since I'm already planning on going back for the fajitas, they need not worry! The beans were just blah. No flavor to speak of at all. Overall, I was very impressed, and I'll be back. Well, I may wait a year(or five!?!?) for them to finish the construction on Oltorf, but I'll be back! $3.50, that is all I paid for my 45 minutes with two friends, two tacos, all-you-can-eat chips and salsa, and some water. That pretty much guarantees I'll come back again. On the whole, the place is a great lunch place with very attentive service. The space is small and cozy, but somehow always seemed to be full without forcing anyone to wait. As soon as a table opened up, a new person appeared at the front door. Maybe they have a timeshare arrangement on the tables? 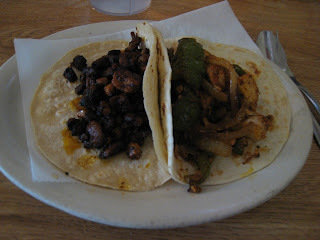 My chicken fajita taco was excellent, and had great tasting, grilled green peppers mixed in with some caramelized onions. As the menu and the waitress both stated, the chicken fajita is the thing to get here. Seriously, get the chicken fajitas. Don't try and get fancy. If you follow my advice, you will leave this place very, very impressed. As it is, I DID get a non-chicken fajita taco. My al pastor was ok, but not impressive. It would have been better if it had come with cilantro and onions. Apparently you have to ask for them, which I did not know. Still, it filled me up, and ok al pastor is better than no al pastor. As Cornbiter D noted, the salsa is quite excellent. It is too good, in fact, to be paired with such low-quality, store-bought tasting chips (think Tostito's). Since I tend to fill up on chips and salsa, I'm going to have to ding Habenero pretty heavily. 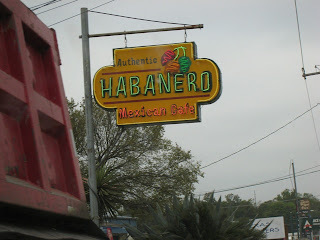 I love Habaneros, and I must caution your that, before the Oltorf traffic torture began, there could be a real wait there at lunchtime. My workmates and I always tried to get there by 11. I like their carne asada as well, though it is untraditional.